We're proud of to offer a true sample of national Uzbek robe. As the Soviet era ended and Westerners discovered Central Asian folk arts, the oriental garments became very popular for their comfortable, rich saturated colors, original designs and bold exotic patterns. East_treasures offers you antique and modern garments, affordably priced and in beautiful condition. Our items are genuine folk art, made by long-term tradition and classical technology. We use only natural ecological materials giving comfort, relax and cozy. LOT women's wedding robe ORIGIN Kashkadaria region, Uzbekistan CIRCA 1960's MATERIALS natural cotton and natural silk CONDITION EXCELLENT, NEVER USED SIZE length-43 in, chest-45 in, From the end of one sleeve up to another-58 in. 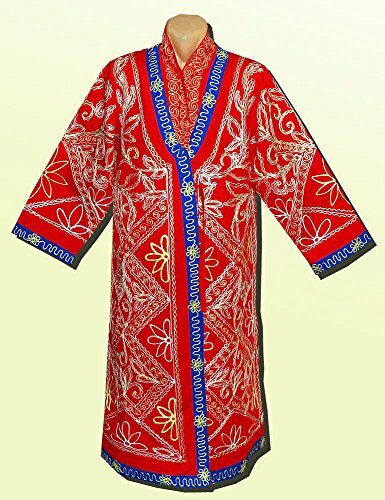 length-109 cm, chest-114 cm, From the end of one sleeve up to another-147 cm Offered here is wedding women's robe from Kashkadaria region, Uzbekistan. Made of natural cotton. The robe is fully decorated with embroidery. The composition consists of the floral motifs with lots of scrolls. Please, let me know your size after purchase. Use my SIZE TABLE in the pictures. I have all from XS till XXXXL. Price is the same. Also, I can add a belt or pockets absolutely free. Thank you !! !